I took my nieces. From age 7 to `15. We all enjoyed it/ I tgink it was a very good family movie with a happy ending. This was one of the best movies I have seen in a long time. It wasn't meant for little tiny kids. But great for adults and families. Amazing movie - well done. Dark, disturbing. My granddaughter started crying and we had to leave. Bullying, animal abuse. No magic in this. Burton should not make movies for children. Phenomenal! One of the best movies I have ever seen. Greater than I expected. I want to see if again and again. BROVO!!! ?? Loved it and my grandsons who are 12 said it was the best movie yet. I love this movie i saw the cartoon and previews. I love this movie. 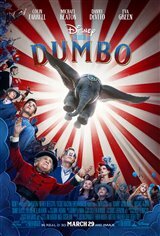 I think that anyone that comes to see this movie after watching the trailer and or previews knows that it is not going to be like the original, there were no kids in the original other then the ones that are making fun of him so I think as long as you come in not expecting to watch the original Dumbo you will absolutely love this movie. Yes it's nothing like the original but it certainly competes with it. Beautifully made movie, great twist to a classic I love. Of course if this is your children's first time seeing dumbo I highly suggest you have them watch the original before or after and explain that it was the version you saw as a child. My 4 year old watched and loved both but when I asked him which one he liked better he said the new one. So go see it and decide for yourself, don't let any other reviews influence you. What a wonderful story, so heart-warming and with a great cast. Loved Danny Devito, Colin Farrel and Michael Keaton. Each portrayed their characters well, wether you loved them or hated them. Fell in love with Dumbo and the kids that took care of him! This is a nice kid movie, or a movie for the kid in older people. Nice movies deserve our support. A great movie, excellent cast and very heartwarming. Dumbo was the freak show in the original who came to be respected. In this version, every actor is a freak show, horrible costumes, bad acting, everyone looked dirty, unkempt, greasy hair, just rolled out of bed - look. No depth, no substance, cold, unfeeling...a typical Tim Burton film. (That is why he likes skeletons) Who ever hired TB to do Dumbo, should be fired. Movie made me miss the original magic of Disney. It had all fluff & stuff, but no depth. It was The Week in the Life of a Flying Elephant. Where was the message? Which was of ‘acceptance’ even though you are different, AND, that everyone has something to offer...even the littlest, meekest, humble. Made me cry, laugh, and cheer! WOW! Loved it! This makes up for all the bad movies Disney has made lately. Don;t miss it. Adorable Dumbo steals the show. Too many long, drawn out scenes last hour lost me, and Michael Keaton was horrible, but overall Dumbo and her mother made up for his horrible actin. DeVito was great. Good Family Movie! Bad thing about this Live CG action Dumbo Movie is the Length. I mean Come On!!?? The animated tale was told in 86 mins, This retelling the same story 2 hrs what gives??? Great family movie! Brilliant sets and costumes! Beautiful story! Dumbo was amazing. Very well made movie....so well that I'd see it again and again. Best family movie in a long time. Far better than Mary Poppins Returns.This is a heart warming story that everyone should see. I loved it. Very well done! My 4 kids aged 12, 11, 8, 3 all loved it and so did I. Well worth seeing. Good job, Disney and Tim Burton! So much cuter than I'd anticipated. I was afraid it would be dark and there would be cruelty (can't bear cruelty towards animals) but there wasn't, it was amazing with a really good message.